Favoured host plants include Apple, Crabapple, Hawthorn, Cherry, Mountain-Ash, Cotoneaster and other members of the rose family. This insect is one of the most widespread defoliators of deciduous trees. 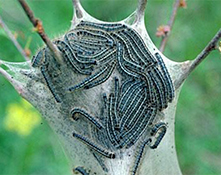 The young caterpillars quickly gather at a major branch fork and begin to build a web from which they go forth to feed on newly opened leaves. Larvae spin a fine strand of silk wherever they go. As the caterpillars grow, so does the size of the tent. When populations are large, whole trees become covered with webbing and all leaves are devoured. Eastern Tent Caterpillars overwinter in egg masses on twigs of the host plant. 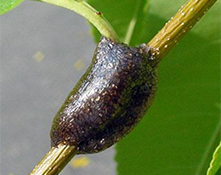 Egg masses can be found encircling twigs throughout the winter and early spring. 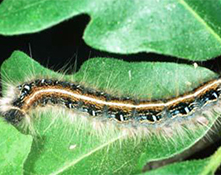 Larvae normally hatch at about the same time that the host plant is beginning to leaf out. Larvae create silken tents in the branch unions and emerge from the tent to feed. The fully grown caterpillars are generally black with a white stripe down the back and a series of bright blue spots between longitudinal yellow lines. As larvae mature they leave the host plant and look for a place to make their cocoons. The adults emerge in late June or early July. There is only one generation per year. Egg masses should be removed before young larvae hatch. Monitor for young larvae around the time that Norway Maple or Amelanchier are in bloom. Prune out webs while they are still small. Removing webs should be done on a cloudy or rainy day, when caterpillars are inside the web. If insecticide treatments such as BT are used, the web should be broken open as the tents provide protection from some insecticide applications.